Encouraging your kids to go outside and explore will allow them to experience the world in a hands on way. Getting physically active, running around in nature and minimizing screen time all have positive benefits that help develop healthy and happy children. Buying a pair of binoculars for your child will give them the opportunity to see the world from a new perspective that they wouldn’t normally be able to, which will engage their minds and adventurous spirit. An adult pair of binoculars may be difficult for them to use, and need to be handled with care. For children who love running around and playing with their friends, adult binoculars are easy to break. Fortunately, there is a wide range of kid-friendly binoculars available, specially designed to give your child the best experience. If you’re interested in getting your children a pair of binoculars, the following list features binoculars that are perfect for your child. I have also included a step-by-step buying guide for binoculars to make sure that you have all the information you need to make a well-informed purchase for your children. Not sure what’s available on the market? Here are my top eight child-friendly binoculars that your kids will love! The Beetle Mini Tough is a compact set of binoculars made from high-quality plastics and rubber, to be as durable as possible. Boasting a sturdy and versatile design, your children will be able to explore all of nature’s hidden gems from afar. Due to the eight levels of magnification and the 5×30 power crystal lenses, details will be magnified brilliantly. Specifically designed for children between the ages of five and twelve, these lightweight binoculars have comfortable rubber padding around the eye lenses so your child can use this device comfortably. Whether your child is on a school trip, playing with friends or spying on things around your garden, the Beetle design will engage your child’s mind. What's Great About It: The adjustable design allows both lenses to be set at a comfortable distance apart and the rugged exterior means that your child can run around and explore without breaking the binoculars. The Outnowtech Compact Binoculars are perfect for family walks and vacations due to the compact and sleek design that saves space and allows for easy transportation. The waterproof shell is designed to withstand the elements, and the durable neck strap allows you to carry the binoculars without any trouble. The interior of this set contains high-quality BAK4 roof prisms with 25mm 10x lenses that will allow your child to see everything around them clearly. Each lens is mounted on an adjustable bracket, so your child can easily adjust the binoculars to be as comfortable as possible. 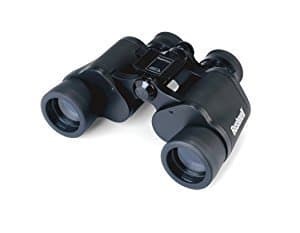 These highly-durable binoculars are designed for children of all ages, and are the perfect choice whether your children have never owned a pair of binoculars before or are looking for a pair to replace their last set. What's Great About It: These binoculars include an easy-cleaning cloth, so your child can easily wipe dirt and dust without scratching their lenses. There’s also an included soft case so your child can attach the binoculars to their belt. If you’re looking for binoculars that provide top quality viewing, the iClarity Optics Binoculars are a great option for you. Another compact design, these binoculars are small enough to be operated using one hand, and boast a high level of quality that you can't normally find in the standard range of child-friendly binoculars. The rugged design maximizes both comfort and durability, sporting waterproof, dust-proof and drop-proof qualities, so your child can play care-free and focus on their experience. There’s an included case to protect the binoculars when they are not being used, and the lens cleaning cloth allows you to maintain and protect the lenses. What's Great About It: The best feature of this pair of binoculars is the superior quality of the lenses. Your child can enjoy crystal clear views with the BAK7 lenses housed inside the 8 x 21 field glasses. This means your child can see clearly up to 122 meters using the 8x zoom magnification. The Kidwinz Shock Proof Binoculars are a mid-range solution that prides itself on durability and value. The structure is produced using rubber and plastics that create a shock proof exterior, which protect the lenses, even if they are dropped from a height. Protection is increased by the portable nylon carry bag and a specially-designed wipe cloth that your child can use to keep the lenses clean. The interior of the binoculars contains five sharp image-producing, 18mm lenses on each side with a capability of 8x magnification, so your child can see clearly up to 122m away. Each lens is covered with a focus-central coating and boasts an exit pupil distance of 10mm. 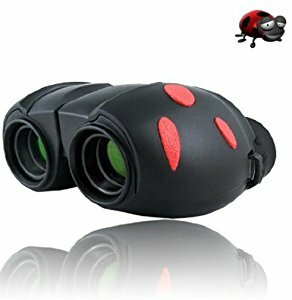 These binoculars are specially designed for children aged 3 and older, and maximize comfort, durability and your child's enjoyment of the great outdoors. What's Great About It: There is a wide range of features crammed into this compact set of binoculars. The 25-inch neck strap is great for easy transport when your child is climbing trees or running around. The adjustable lenses make sure that your child can easily and comfortably set up the binoculars to suit their needs. If you’re looking for superior quality for slightly older children without a massive cost, the Bushnell Falcon Binoculars never fail to deliver. 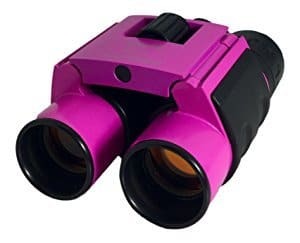 Boasting a whole range of high-quality features, the external part of this set is produced using specially designed high-grip rubber pads that allow your child to easily hold the binoculars in any weather. The fully coated optic lenses are purpose-built for fast light transmissions and the ends offer a special ‘Instafocus’ System, so your child can easily focus on fast-moving objects. The lenses have 7x optical magnification complimented by an auto-focusing porro prism. 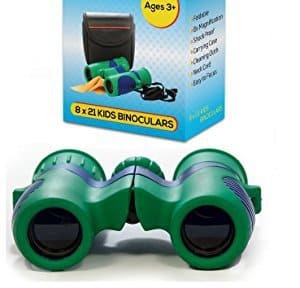 Although these binoculars are a bit pricier, they are built to last, so your children will have these for years. What's Great About It: The lenses feature a 35mm lens diameter and a 20-foot close focusing distance offering crystal clear views. Bushnell is one of the leading binocular companies with over 50 years of experience in the industry, guaranteeing this set of binoculars' performance and durability. The BlueCabi Binoculars are a fantastic all-round choice if you want a versatile set of binoculars. This set is produced using highly durable plastic which is coated in a thick, comfortable rubber exterior that maximizes grip. It also protects the lenses and body from water, dust and other harmful elements. Specifically designed for bird-watching, these binoculars have a sturdy compact design with adjustable lenses, so your child can adjust the settings on the binoculars to make them as comfortable as possible. Available in two engaging colors, each set comes with a nylon travel bag that can be attached to your child’s belt. What's Great About It: This set offers high-quality images from each of the 21mm lenses. The above-average 6x optical zoom and the two roof prisms provide a crystal-clear image that your child can enjoy on their adventures. 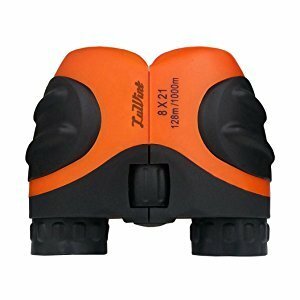 One of the more affordable sets of binoculars on my list, this pair is specifically designed for younger children who are new to using binoculars. The simple controls and adjustment settings allow your child to use these straight away. The external casing boasts a high-quality rubber coating that provides a good grip. Each side has transparent optical glass lenses and prisms that provide an impressive 6x magnification. Each lens has a wide 21mm diameter, while each eye socket is rubber-coated for maximum comfort. 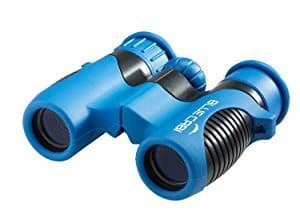 These binoculars are specially designed for younger children aged three and above. What's Great About It: Your child will be able to take these anywhere with ease due to the compact design. The included nylon carry bag protects the binoculars from external elements, and a special belt attachment is included so your child can transport these binoculars easily. Designed for kids who have an interest in the animal kingdom, the LuWint binoculars have many features specially designed for children aged three and above. One of the lightest pairs of binoculars on my list, this set sports a compact design that maximizes performance. The casing is crafted using high-quality rubber and plastics to provide a sturdy grip. The wide-angle lenses allow plenty of light into the binoculars, so your child will have a clear and stable image which is boosted by the Glimmer high-definition feature. The built-in steady viewing feature means your child will be able to enjoy views at distances up to a staggering 128m due to the adjustable 8x optical zoom. What's Great About It: The lenses are industry-standard BAK4 glass that help to create a crystal-clear image. 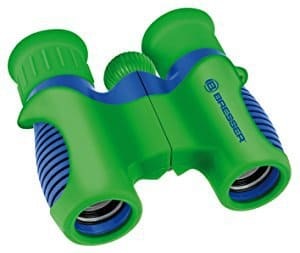 The sturdy grip means your child can fully engage with the environment without worrying that the binoculars will slip. More in Outdoor Toys: What are the Best Kites for Kids? Shopping for the perfect pair of binoculars is no easy task, especially when it’s for your children. 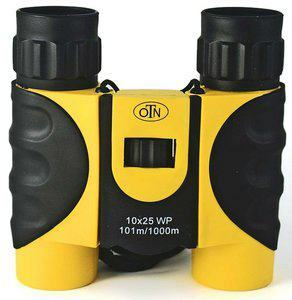 Whether this is the first pair of binoculars your child will have or you have bought a pair in the past, follow my step by step guide below for everything you need to know about binoculars, so you can make the best purchasing decision possible. This is one of the most important aspects to consider as this is the purpose of binoculars. The industry standard for magnification is 8x. This will give you a clear and focused image while maximizing the opportunities to zoom in to see things from a distance. You may be tempted to invest in an adult pair of high-performance binoculars so you child can enjoy more magnification, but there are several negative downsides to this. A highly zoomed image can be hard to focus on if your child has shaky hands. If this happens, your children may quickly become tired of using the binoculars. An 8x magnification boasts many other benefits including a wider field of view and better image quality in low light areas for your child's developing eyes. Commonly known as FOV, this is the feature that is used to describe the width of the image seen through the binoculars. If the image is not wide enough, your child may find it difficult to find what they are looking for. It is also a lot more difficult to track moving objects. When choosing the ideal binoculars for your child, try to choose one with a wide field of view. To maximize the field of view, choose a set of binoculars with a magnification of 8x or 7x. When choosing binoculars, it’s of the utmost importance that your child is comfortable when using them. The first thing to consider is the quality of the grip. It’s recommended that you choose a rubber casing, preferably with molded hand or fingers holes. You should also choose a pair with rubber rings around the eye section. This will provide a soft cushion for your child’s eyes. Size is an important aspect to consider. When shopping for children, look for a medium to small compact sized pair of binoculars that will allow your child to run around freely. A smaller size will also allow your child to hold the binoculars more easily in their hands. The binoculars should be lightweight enough that your child can operate it without difficulty. Many pairs of binoculars come with neck or wrist straps that your child can fix to their bodies so they can carry it around with ease. Select the lightest pair of binoculars possible that will still deliver the quality you are looking for. With most binoculars, you can adjust the distance between the lenses, so you can keep adjusting them until they are comfortable for your face and eyes. This means they can be used by all of your children without having to buy different sets. Many children’s binoculars come in a compact design, so you will need to check that they are adjustable. As with any child related purchase, the price is always an important factor to consider, as you don't want to waste money on binoculars that are easily broken. Most children's binoculars are designed to be thrown around, dropped and knocked, and have external protection. Although some child-friendly binoculars may seem cheap when compared to adult binoculars, they are purpose-built for children. 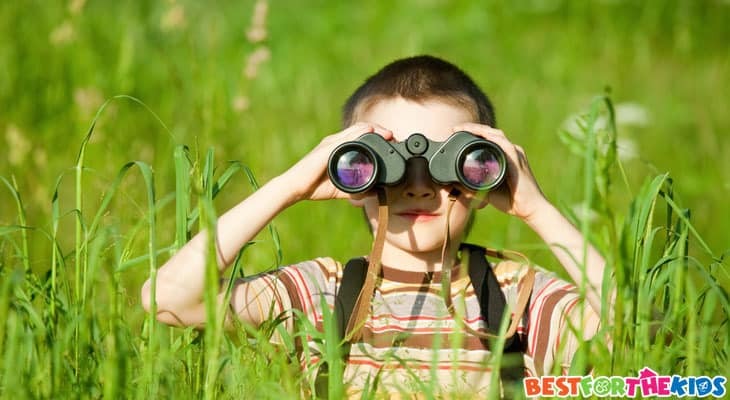 The above suggestions are some of the best child-friendly binoculars on the market. By investing in the right pair, you can encourage your child to enjoy an active outdoor activity that could transform into a lifelong hobby. Make sure to follow the buying guide carefully so you buy the perfect set of binoculars for your little adventurer.